6. 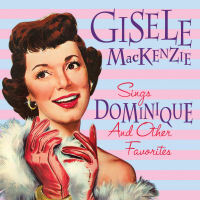 MOONGLOW and THEME FROM "PICNIC"
On this reissue are 28 of Gisele MacKenzie's recordings from 1955 to 1962 including "Dominique", popular standards - "Unchained Melody," "Blue Tango," "C'est Si Bon" & " The Song from Moulin Rouge" and her single releases, many of them making their debut appearance on CD such as "Mr. Telephone," "Dance If You Want To Dance," "The Star You Wished Upon Last Night," "Oh, Pain! Oh, Agony!," "The Waltz That Broke My Heart," "This I Know," "Never Go 'Way," "They're Playing Our Song," "You Dream Of Me" and "In Milano."